Turn your data into interactive dashboards! Analitics: usually focused on the analysis of information about the past (historical/statistics), or about information that is known in advance (forecasts). The main trait of these dashboards is that data does not change very often and the time frame is usually long. Some examples: A company's sales evolution and forecast, sport statistics in general, etc. Real time: their main trait is that data changes at a very fast pace. Therefore, this requires to update the indicators & reflect the changes in the UI frequently. Usually, the data is bound to a very short time frame, such as the last 10 seconds. Real time dashboards are typically used to monitor critical resources or systems, for example: Health display sensors, IT resources, air traffic control, etc. Dashbuilder is a general purpose dashboard solution. One of its design goals is to support both approaches. The following video shows an example of a real time dashboard built using the Dashbuilder GWT Client API (do not forget to select HD). 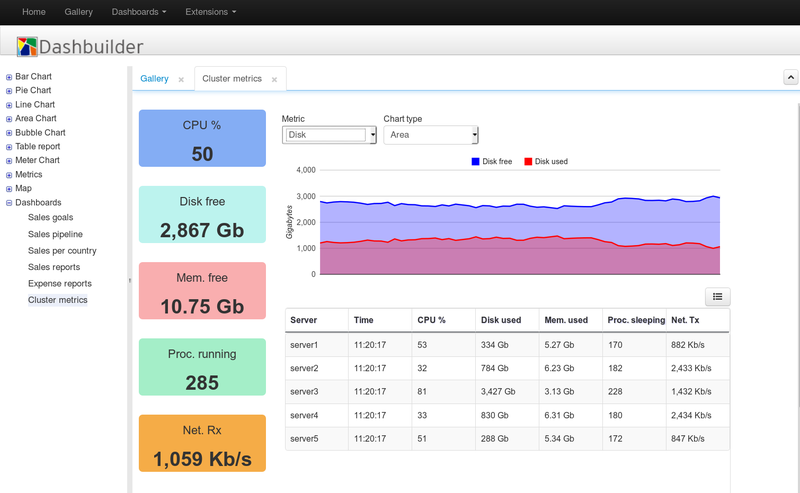 The dashboard contains some metrics about an emulated cluster (the values shown are not real). 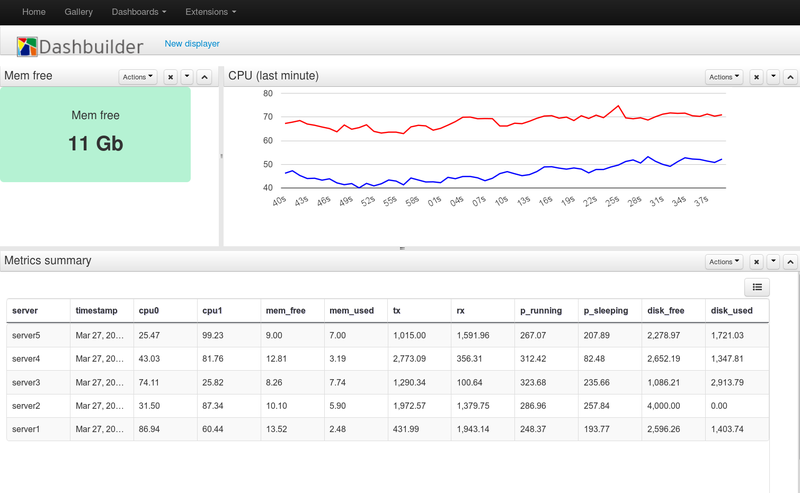 The dashboard is part of the Dashbuilder examples gallery and it's basically a GWT UI binder widget (source code here). Not only we allow for creating programmatic dashboards but also for custom ones created by end users. The next video (select HD) is a demo of how to create a real-time dashboard from scratch using the tooling. Here again, we're using the emulated cluster metrics data set, so the values shown are not real. As you can see, Dashbuilder covers a wide range of scenarios. As we introduced in this blog entry, data can be extracted from different systems. Once you have the data you can easily create your own visualizations. Both the analytics and real-time approaches are supported out of the box. The current distribution has proved to be very valuable for customers who need to build custom dashboards the main reason was to accelerate the development of new top essay writing companies features as well as to make easier to enhance existing features leveraging the power of GET. please let me know what might be the issue. Son, unfortunately the dashbuilder UF seems to be lacking proper documentation. It doesn't come with any built in application user. You need to create a new user using add-user.bat (in windows) in the bin directory. But I am also facing problem - the created user doesn't have a 'new' in the drop down from 'dashboard' after loging in. Not sure what is the issue.